After nearly a decade of using the excuse that the sideways-facing rear seats in Timmsy’s Landrover made me travel sick, I finally I had to vacate the front seat and let the chairman ride shotgun as the brand new model made its inaugural tour recce. A meandering eastwards route in bright spring sunshine eventually led the intrepid team of myself, Tony, Sandy, Richard and Fish to Uppingham, and a very narrow dirt track access to their ground (where we nearly lost a wing mirror). 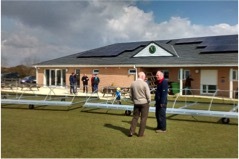 We were met by Kev, the affable clubhouse chairman, who gave us a guided tour of their impressive pavilion. 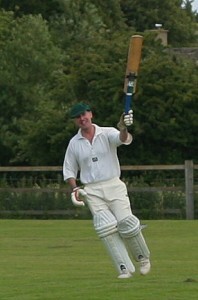 For saying this ground wasn’t opened until four years ago, having previously been farm land, I doubt Barford will ever play on a flatter outfield (which overlooks the early stages of a golf course that was never completed due to the consortium running out of cash-and six grand was nothing to them). 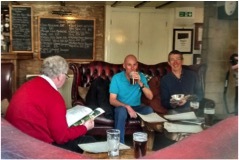 Next port of call was the latest entry in the now legendary ‘Richard Jones Good Pub Guide’ for a spot of lunch. The King’s Arms in the village of Wing is a traditional country inn with its own smokehouse and poultry pen. Very high standard cuisine and a charming hostess, but the main attraction for me was Ten-Fifty, the superb ale from Oakham’s Grainstore Brewery. The only negative point was a couple of extras from TOWIE eating half their lunch and then complaining just to get their money back. If, as I imagine, this becomes the meeting place for those travelling down on Friday morning then I suggest booking as it’s not very big and gets busy. 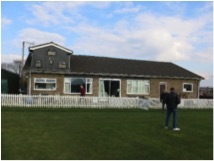 Wakerley & Barrowden’s ground is slightly more uneven but has plenty of rural charm with its white pavilion set in the shadow of a line of trees and a stone wall circling the playing area (I imagine the attached picture will have Pete Romyn frantically calculating gradients and inclines into his captaincy plans). The final ground on our list was Saturday opponents Empingham. 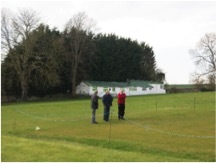 We were fortunate to arrive as the groundsman was diligently preparing things for the forthcoming season and he kindly showed us around the pavilion. The clubhouse is used by the village as a social club so we might even get a couple of spectators! With the three grounds and lunch venue sussed we arrived in Oakham and checked into The Old Wisteria. The rooms are good, especially for the price we’re paying, however the owner didn’t seem particularly interested in hosting the Saturday meal so we headed into town to see what was on offer. For an affluent county town there is a dearth of restaurants in Oakham as we passed a very ordinary Indian and a slightly better Italian, both of which had staff eagerly waving us to come in…oh, and a Chinese takeaway called ‘Wok This Way’(!) 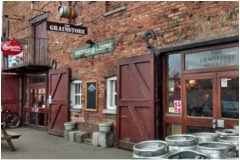 Thankfully this search did lead us to The Grainstore Brewery which has its own bar next to Oakham Train Station. As I drank more Ten-Fifty than I should have Richard consulted TripAdvisor and we decided to explore Baker’s Yard, which seems to be a split of a bar and tapas restaurant (I should add there is a Weatherspoons but needless to say, we didn’t bother). Baker’s Yard could certainly do a job but we decided to give our enthusiastic Italian friend a chance. The meal was adequate and hosts amiable, but the fact we were the only ones in there all night makes me wonder if they’ll still be open in July. Over-indulgence at The Grainstore was taking its toll and I turned in leaving the chairman and the retirement community to sample the hotel bar (which I never got to see during the trip!). The following morning an excellent breakfast was served by the friendly receptionist, but the previous day’s sunshine had been replaced by freezing wind and rain so we headed home, avoiding Leicester as Richard III was being re-planted. Oakham is fairly limited in terms of entertainment (there was some place called the XY Bar which looks as if it could keep the sniffers happy and will probably result in Drage’s absence when the telegrams are read out on Saturday) but there is enough to keep everyone happy. As regards cricket, right from the start the people of Rutland (Judy, Chris, Kev and Adi) have been so accommodating and helpful in organising this tour that I’m confident it will be a good one. Finally the usual vote of thanks to Timmsy and his new chariot for all the chauffeuring.